After last year's downpour...we encourage everyone to please make a TeruTeru Bozu and wish for dry weather this year! As part of the Southern District Buddhist Churches, we will be dancing all the dances that all the other temples have been learning this summer. Practices are held on Tuesday and Thursdays from 7:00 - 8:00 PM in the Temple parking lot. Bring a tenugui (towel) and "naruto clappers" (image on the right). FOOD for sale will include: Unagi-Don, ChaShuBao, Lumpia, Chirashi (on Saturday), Maki and Inari sushi on Sunday, Beef Teriyaki, Chicken Teriyaki, Hot Dogs, Street Tacos, Roasted Corn, Chili on anything you want to have chili on...and our very famous Beef Chow Mein with Pan Fried Noodles! Raffle Prizes this year are : 1st - $1,000 2nd - $500 and 3rd $250. Winners do not have to be present for these major prizes. Other prizes will be raffled off during the day, so buy your tickets early and maybe you'll be a winner! Sign-up to help at Obon! Click on the dates below and you will see the sign-up sheets. If you are not sure where to work, contact Dona Mitoma, she will assign something to you. We have many, many types of Festival food for purchase in our outside booths, Food Court (classroom annex) and gym. New this year (no photo): Tofu Salad, Lumpia, Matcha Lemonade. Others not shown: Tamales (chili optional), Tsukemono, Beef Teriyaki, Chili Rice and more! Please note: Day change: Chirashi rice (Saturday only) and Maki sushi/inari sushi (Sunday only). 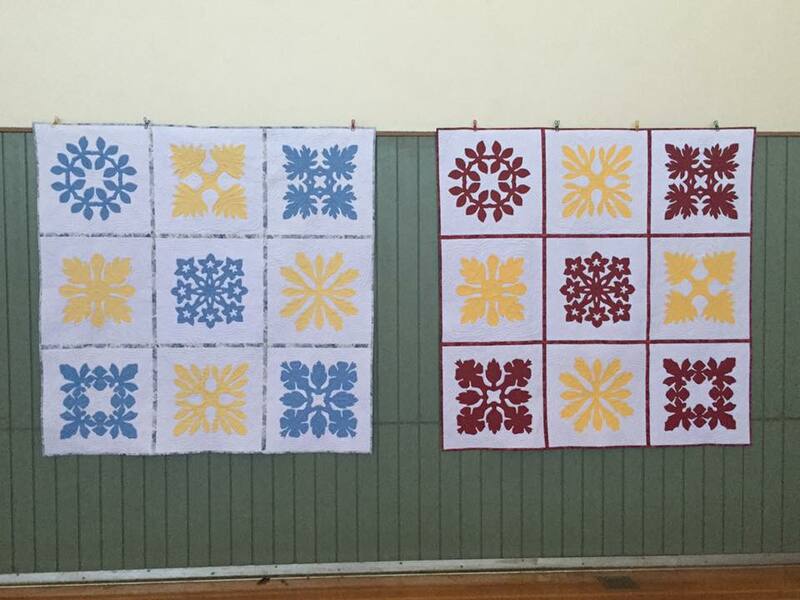 These quilts, handmade by our Sumireikai sewing group, will be individually placed in auction. 60" x 60". Starting bids of $250. Which will sell for more? GO BRUINS! FIGHT ON!